If the movie Beginners were a book of poems that book would be Left-Handed: Poems by Jonathan Galassi. Like Hal Fields, the character played by Christopher Plummer, in his mid-fifties Mr. Galassi fell in love with a younger man and discovered or acknowledged to himself that he is gay. This realization caused a crisis in his three decades’ old marriage, which ended six years later in divorce, and fueled the writing of the poems in this book—his most emotionally raw and formally inventive to date. The book’s three sections, A Clean Slate, The Crossing, and I Can Sleep Later correspond to before, during, and after the speaker’s unconsummated relationship with a male character he names Jude, whom Mr. Galassi has acknowledged elsewhere is a fictional representation of the literary agent Bill Clegg, the above mentioned younger man with whom he fell in love. how I admire those who wouldn’t wear them. “I tried, and each attempt was a fiasco. is elsewhere, no return, no spark. heightens the native-sense of sin. “Seventh Avenue,” a three and a quarter page walk in the city poem reminiscent of the late James Schuyler’s “Dining Out with Doug and Frank,” describes walking the length of Seventh Avenue from Central Park West down to Greenwich Village and the people different buildings and other landmarks call to mind. The poems in I Can Sleep Later describe another breakup, this time with Jude, who is replaced by another beloved, Tom. In “Tom in Rome” Mr. Galassi compares Tom to a statue of Antinous, the Roman emperor Hadrian’s lover, mentioning other famous sculptures, three kinds of marble and two kinds of limestone. The book’s last three poems are dedicated to people identified only by their initials. 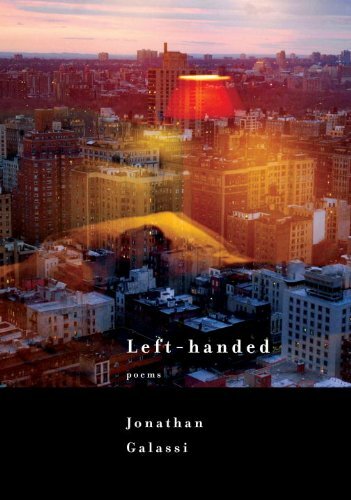 Left-Handed: Poems is strongly recommended to all poetry lovers and to all readers who find they must radically change their lives in order to live more authentically.